So, I was walking to work the other morning, and noticed this bin on the pavement outside someones house. 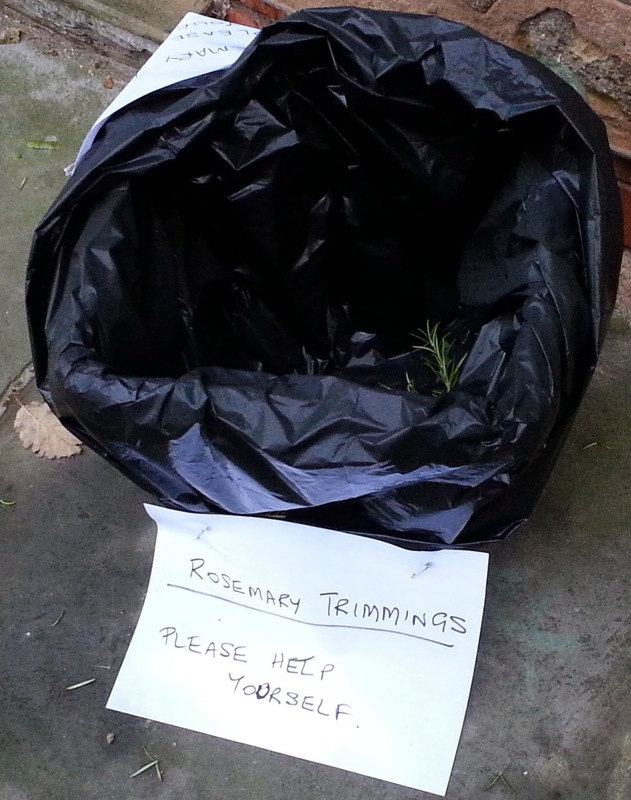 If it's not clear, it says "Rosemary Trimmings - Please Help Yourself". This puzzled me. Who is this Rosemary person? It's a very specific offer - if you are Rosemary Trimmings, help yourself to whatever is in this bin. And obviously they had done, because the bin was empty. Maybe Rosemary is some kind of kleptomaniac, and keeps stealing things, and to satiate her desire to obtain goods illegally someone had resorted to placing sacrificial items in an easily accessible container so that Rosemary would take them rather than trying to break in? Perhaps it was a passive-aggressive note to Rosemary who always nicked the neighbours newspaper, and they've gone to the trouble of buying two newspapers and then placing one in the bin so she can take that one. After about three or four minutes considering this, I hit upon another possibility. Maybe they had a rosemary shrub. And they had trimmed it. Coffee in a morning is obviously not optional. Very funny, Mike. It is always a pleasure to read your older work! Are you ready for Apple Dumpling Day? How to make a living by being a geek - honest!